From time to time whether you find yourself doing house chores or simply getting ready to start your day there is a “go to” artist or album that will get you through the task at hand or the boost to start your day. 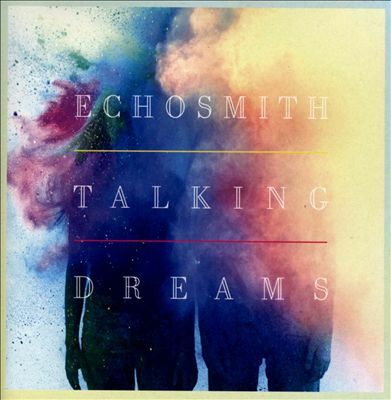 Listeners will find Echosmith’s 2013 release, “Talking Dreams”, to be one of those albums for any fan of the indie pop genre!! The first track, “Come Together”, quickly reminds me of a good ol fashion U2 song right off of “The Joshua Tree”. Noah seems to really drive the bass lines along with Sydney who brings a familiar U2 hint to the keys. “Lets Love” carries that first love experience lyrically and we can hear a great combination of front lady Sydney’s vocal work with her brother’s support. A nice upbeat groove kicks off “Cool Kids” that has well textured rhythms. Any person that has ever experienced high school can relate this track’s lyrics of how they perceived themselves along with that desire of hanging with the in-crowd. You find artists who will relate their music with their surroundings. Since most members of Echosmith are late teens, this song is a direct reflection of that high school angst that says its ok to just be yourself! “March Into the Sun” continues the up beat drive of the album and will stick a slight yodel in the back of your head that will creep up on you when you least expect it in a pleasant manner! “Come With Me” has a soft tone with a constant snare that blends well with the ukulele-ish strums. Can’t have a good indie album without shining out with the acoustic guitars as in the song “Bright”. This steers us right into the album’s titled track “Talking Dreams”. This track will complement any back road drive in the early sunrise with nice lead work brought on by Jamie. Echosmith is basically laying out all the rules for any young man begging for a female companion in the track “Tell Her You Love Her” with a mellow well-composed style. Graham kicks off “Ran Off in the Night” with a nice drum intro (my personal favorite way to start off any song) and has a chorus that is intoxicating that will attract anyone who is a fan of lyric repetition. As the album flows on, “Nothing’s Wrong” delivers the continuous formula that is Echosmith. This track offers a “pixies” style guitar strum that brings back that 90’s alternative scene. There is a nice, safe setting that comes to mind when “Safest Place” picks up as the change in pace. In the final track, “Surround You” drifts into a nice, mellow harmony vocal style that sends the listener into a calm realm. Those who purchase the deluxe album are graced with additional tracks: 13.) “Up To You”, which reminds listeners of the 80’s alt rock scene with solid picking from the lead strings; 14.) “We’re Not Alone” ends the album on a solid, positive note with a great versatile melody that compliments the vocals with a Fleetwood Mac feel. So whether you are starting the day off or just trying to relax with a few friends, the overall melodies and string arrangement will entice you to overall just be happy! My personal favorite track is “Ran Off in the Night” and would recommend this album to any indie fan or Starbucks addict. You can expect great things in their near future with these bright young L.A. stars in the indie scene with ages ranging from 15 – 21 who are all siblings. Keep it real Echosmith!! Jeff Walker is 35 years old and lives in Orange, Texas. He is happily married and has a son and daughter who are the light of his life! Jeff currently is employed as a production operator at Dupont and plays the drums in a local Christian rock band 70times7. 70times7 are affiliated with B.U.M.M. (Beaumont Underground Metal Movement) which is a local promotion group leading the local metal scene. He accuired a passion for music at a young age and has been involved in bands and recording since the age of 13. Jeff pursues writing music and writing about music including latest artists and latest album releases. Some of Jeff’s favorite bands include 311, Helmet, God Lives Underwater, The Melvins, Sleeping Giant, and Deftones.